Home Products Inc.: Upgrade That Old Fan! Homeowners can easily increase their bath fan’s performance with the new Bath Fan Upgrade Kit from Broan and NuTone. The upgrade kit reduces noise while at the same time increasing power and enhances the appearance of an economy fan in minutes. No rewiring, no new duct work and no hassle is required, according to Lynn Mantha, product manager for ventilation fans. 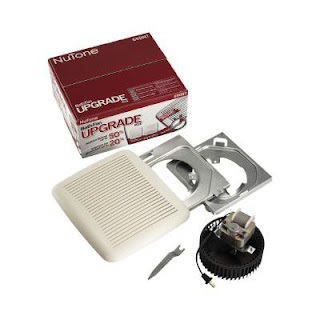 The Upgrade Kit can be used to replace specific Broan, NuTone and Nautilus® bath fans, providing homeowners’ with a quick and convenient way to transform the sound levels and air movement in their bathrooms. “The Broan 690 and NuTone 690NT Bath Fan Upgrade Kits include everything needed to transform a bath fan from loud, ineffective and unattractive to quiet, powerful and modern in ten minutes. In the kit, homeowners will find a new fan grille, a quieter, more powerful fan motor, a wrench, two motor plates (depending on the homeowners’ existing fan model) and step-by-step instructions,” says Mantha. “Typical bath fans operate at 4.0 to 6.0 Sones. The motor included in the upgrade kit operates at 3.0 Sones. Additionally, the upgrade kit boosts air movement up to 20 percent and helps control humidity that causes mold and mildew,” says Mantha.